The first four wins get you NO loots, he doesn't trust you yet! 50 and 100 wins gets you an earth mage amulet. 150 gets you an earth tome. 200 gets you another EMA, a Earth Defense Baguette and an Earth Baguette. The baguettes get dropped a lot along the way, as do Pawn Shop Guy Plushie, Grazia Double Bass, Cream Watch, Graphics Tablet, All About Coins, and Blingtastic Rolecks Watch. "Jeremy sprays you with a water cannon, but can anything cool off your insatiable desire for cheap CWs?" Thanks for the info about silver not working! 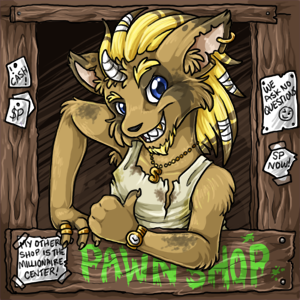 It may only be gold that works, which would make sense that's usually associated with pawn shops in real life. I just sold him a Gold Guitar Pick, and got him as an opponent. I just sold him an item with silver in the name, didn't get the challenger. Maybe it has to be gold? Love the loot for this challenger! Thanks! Love this - and love that I have finally been training a pet to be able to fight. Jeremy challenges you to a fight in the Battle Coliseum! The dude couldn't afford new challenger art? Aww, he’s an itty bitty guy acting all tough. What @Laurey said. I can't say about silver or other gemstones... I sold him a Golden Pherret Plushie and that worked. I sold him the Gold Ocarina like someone else mentioned and it worked. But I'm guessing other items probably also work. Not sure about other key words though like Sapphire, Emerald, other gemstones maybe? He's gonna call you Chumlee. I just bought an item (Gold Ocarina) and immediately sold it back to him, lmao. I'm Jeremy the Demi, and this is my pawn shop. I work here selling quality goods. Everything in here has a story and a price. One thing I've learned after 10 years- you never know what is gonna come through that door. @seraph then i must defeat him then.